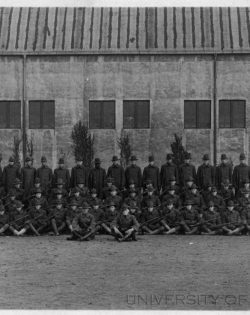 1918: The year without a Homecoming – Storied. The year without a Homecoming. 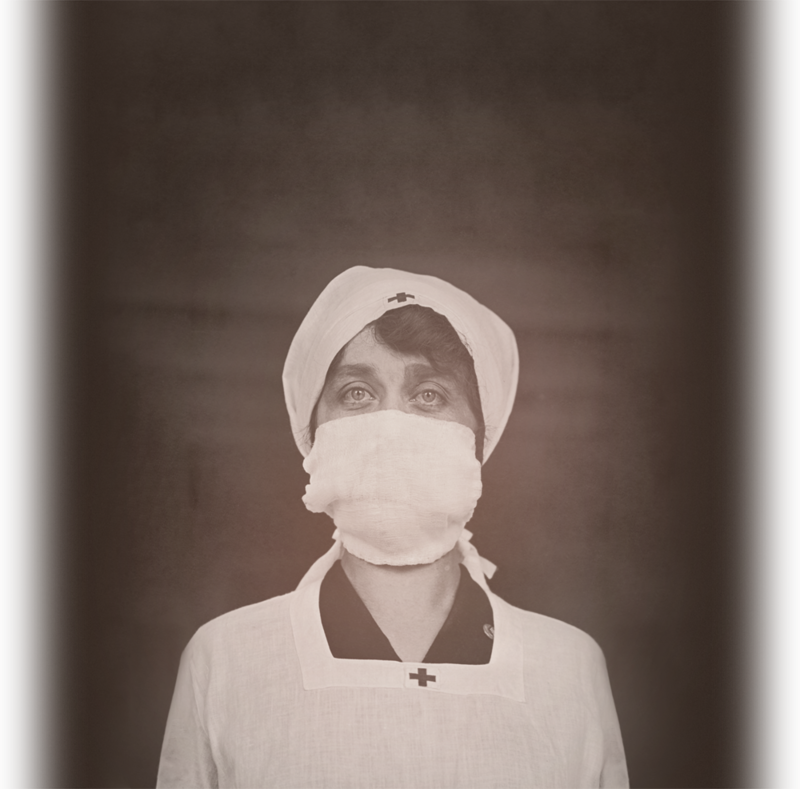 In October of 1918, as soldiers entered what would be the final days of a devastating war, the world was gripped by the deadliest influenza pandemic it has ever known. It swept across the globe with unprecedented speed. Roughly fifty million people would die in the fifteen months of the pandemic, more than were killed in WWI and WWII combined. 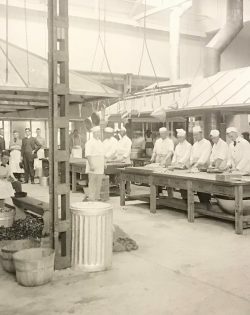 On the hundredth anniversary of this difficult autumn, we look back at a campus that prepared soldiers for war, tended to the sick, and came together in a spirit of selflessness and compassion that was the hallmark of some of our earliest Illini. 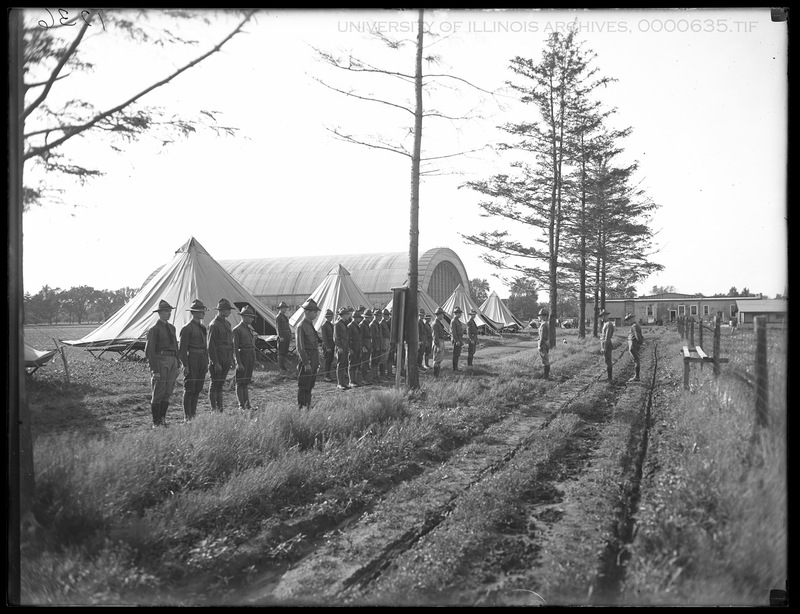 Photographs courtesy of the University of Illinois Archives, who we thank for their assistance with this story. This was a year like no other. In 1918, war was raging overseas. The world had endured four painful years of battle, leaving cities and villages in ruins. Between 15 million and 19 million people were killed in World War I, including thousands of young American soldiers and nurses who were buried in French fields far from home. And there was another war raging around the world, one with an enemy that was invisible to the eye and seemingly impossible to control—influenza. What is usually a mild illness had exploded into the deadliest pandemic the world had seen since the bubonic plague wiped out nearly half the human population in the fourteenth century. The plague killed 75 million people over the course of one hundred years. It took only fifteen months for the flu to kill roughly 50 million people. The flu moved so quickly through communities that many just simply shut down. 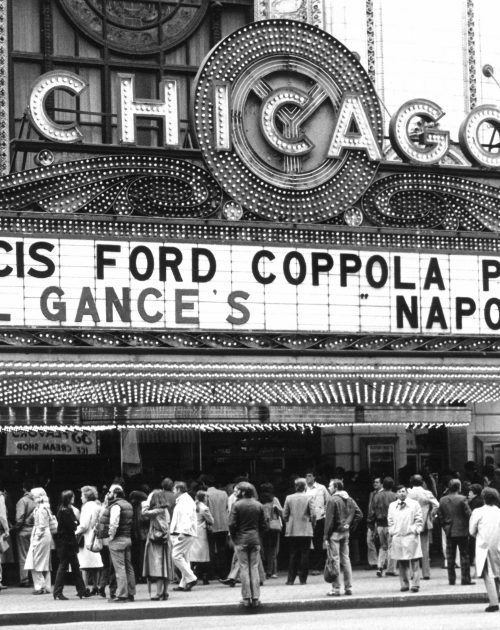 In an effort to quell the spread of the illness, dances were canceled, movie theaters closed, streets were quiet. Turner was recovering from the illness himself and knew firsthand how debilitating it could be. By the time he stood at the gates, one million people in the state of Illinois had been infected and hundreds of his fellow students and army buddies lay in campus buildings converted to emergency makeshift hospitals. As he watched empty bleachers collect rain, while the world around him was consumed with battle and quarantine, Turner was witnessing a small piece of Illinois history set in a much larger historical moment. At Illinois, this was the year without a Homecoming. 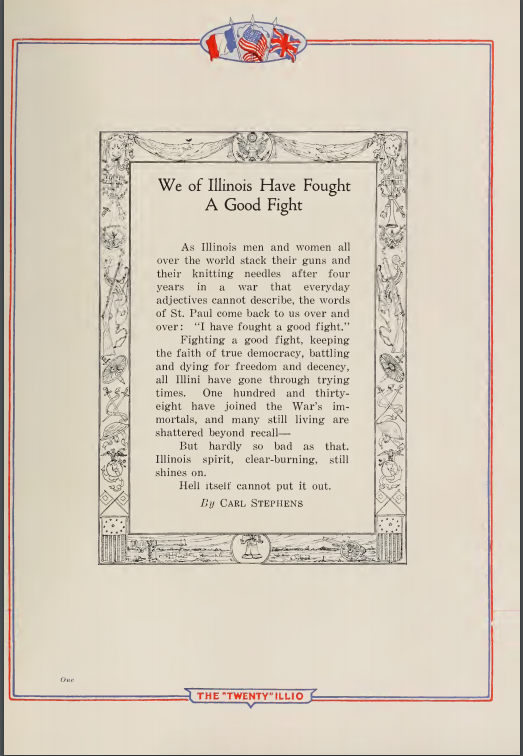 Homecoming was a relatively new concept in 1918, not only at Illinois but at universities across the country. 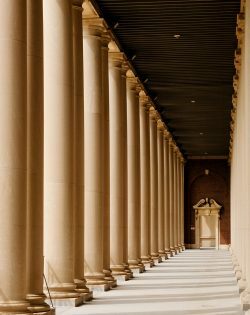 Former students would often return to campus for spring graduation, but two Illini argued that this time of year didn’t encourage proper fellowship between alumni and students. By graduation day, they noted, most students had already left campus for summer break and seniors were too preoccupied with the ceremony. Clarence Williams (B.A. 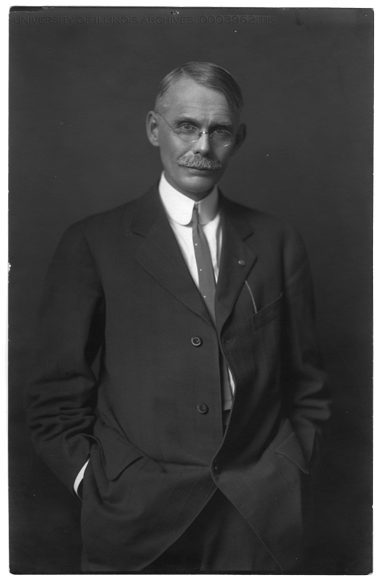 1910) and W. Elmer Ekblaw (B.A. 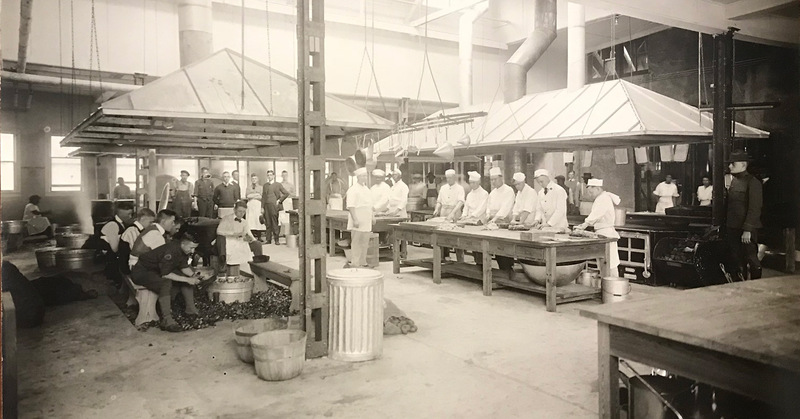 1910) suggested instead that the alumni should return to campus in the fall, and that multiple events could take place over the course of a crisp, autumn weekend. 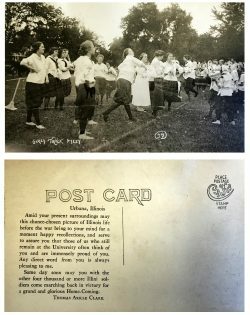 After much discussion and planning, the first Illinois homecoming was held in 1910 and drew thousands back to campus. Banquets were arranged, class reunions were held, and orange and blue bunting hung from university buildings. The festivities culminated Saturday afternoon at Illinois Field when the alumni and students gathered to watch the football team play its rival, the University of Chicago Maroons. Homecoming was a success, and the tradition remains one of the most beloved events on campus over a hundred years later. 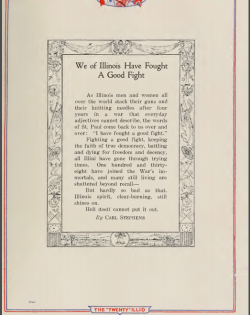 There has only been one year when Illinois did not celebrate homecoming and that was in the fall of 1918, when battles in Europe struck down soldiers and civilians—and back home, influenza did the same. Once the danger of (what was then called) Spanish Influenza became clear, all plans for celebration were set aside. The influenza pandemic of 1918 actually swept across the world in three waves. 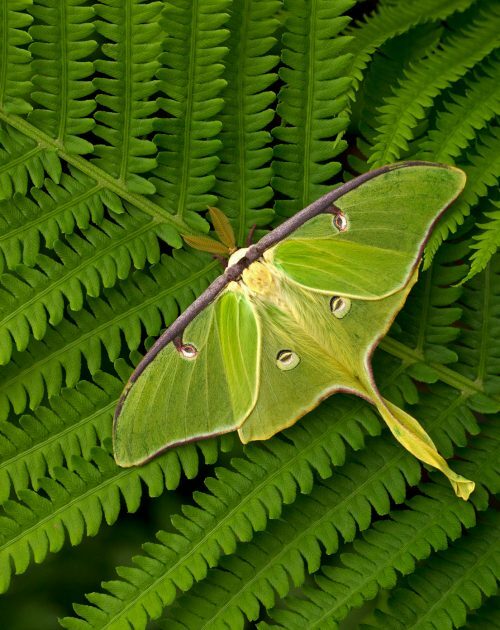 The first occurred during the spring, its journey helped along by the movement of soldiers in World War I. While the number of people who fell sick was notable, the illness was mild and so didn’t raise alarms. By the fall, however, this particular strain of influenza began appearing again—this time with unexpected virulence. The conditions of war, including close quarters and lack of sanitation, played a major role in the spread of the disease not only in the trenches and the training camps, but on the ships that moved troops across the Atlantic. By the time the SS Leviathan docked in New York in early October, for example, more than 2,000 cases of influenza had erupted aboard the ship. It was carrying over 9,000 troops who were coming home from France, among them future president Franklin Delano Roosevelt, an assistant secretary of the Navy at the time. He developed influenza and then pneumonia on board, and, like many others, was so weak he needed to be carried off the ship. 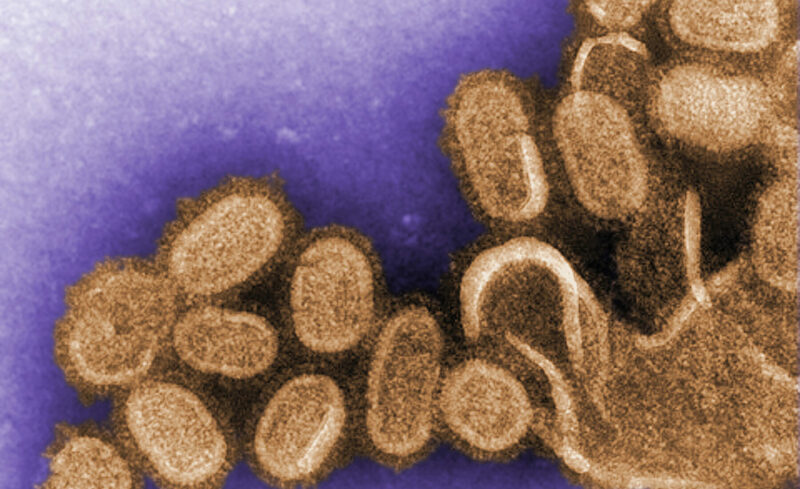 The influenza that emerged in the fall differed in many ways: in the number of people infected, the high mortality rate, and in the types of people who were especially susceptible. This was a disease that was targeting young, healthy people who were usually not at high risk for lethal complications from flu—including college students and military personnel. 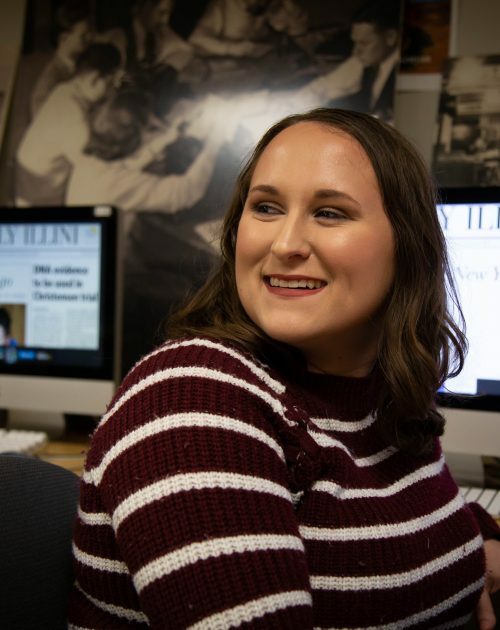 The first reported case of influenza at Illinois was diagnosed on September 27, and the speed with which the virus overtook campus mirrored how it was unfolding everywhere else. People quickly realized that not only was this flu passing from one person to another at an exponential pace, but once a person was infected, the illness was deadlier than they had seen before. The Department of Public Health encouraged citizens across the nation to do all they could to prevent contracting the disease. 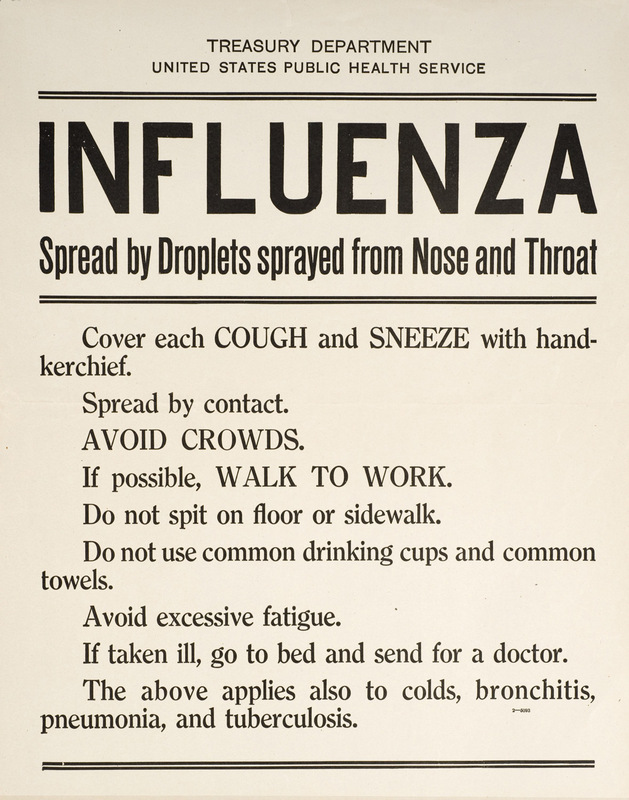 Posters and advertisements appeared in newspapers telling people to avoid crowds and public transportation, cover coughs and sneezes, and stay home if sick—many of the actions that might be suggested today. Fresh air and open spaces were a central message in flu prevention as well, from keeping bedroom windows open to walking to work. In San Francisco, some judges even held court outside. In this tumultuous time, Illinois pulled together and revealed the strength of its character. But despite these efforts students on campus still became sick—far too many for the small university hospital to handle. Dedicated staff members on campus transformed fraternity houses and dance halls into makeshift infirmaries, stood by bedsides as students’ fevers raged, and answered the daily telegrams and letters from worried parents. In this tumultuous time, Illinois pulled together and revealed the strength of its character. Out of these extraordinary circumstances, one man emerged as a natural leader: the university’s Dean of Men Thomas Arkle Clark, at once a counselor, an enforcer, a friend, and a father figure for thousands of students. By October 1918, the world was war-torn and weary. Earlier that summer, in an effort to attract more recruits, the War Department created the Student Army Training Corps (SATC). 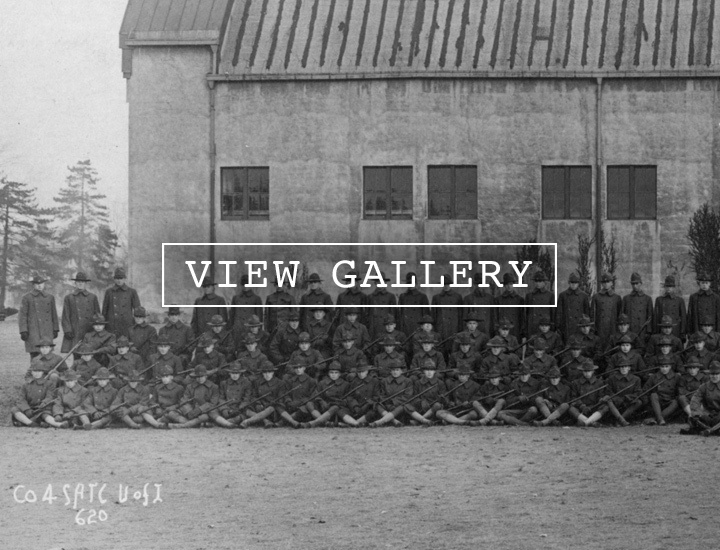 Men who enlisted in this voluntary program became privates in the U.S. Army as well as students at the university. They were placed on active status, meaning they could be deployed at any time. The government paid for the students’ tuition and housing and provided the student a monthly stipend of $30, equivalent to $539 today. The program was introduced in mid-summer and by the time classes began it had attracted 140,000 young men and had a presence on 525 university campuses across the nation. 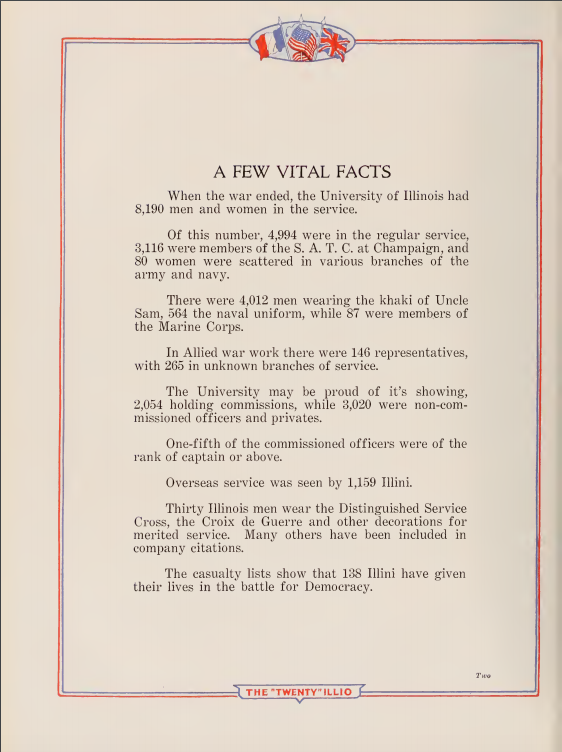 Illinois welcomed nearly 3,500 student soldiers, either new students or continuing students who had enlisted, a number that comprised nearly half the student population that fall. The work was intense and involved an incredible amount of coordination between those in charge of facilities, local residents, military leaders, and campus administration. Blueprints were drawn, boilers installed, contracts signed. Students returned to campus during the second week in September for entrance exams. The SATC men were officially inducted on October 1, university classes began on October 3, and by October 4, only one week after the first case on campus was reported, the number of flu cases began to swell on campus. The influenza crisis was now overlapping the upheaval caused by coordinating the SATC. With no time to rest, Dean Clark moved from one massive undertaking to another. Champaign, Ill.10-1-18WWI TRANSFORMS CAMPUS. 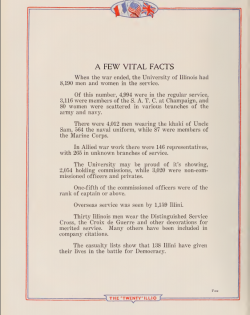 Thousands of Illini served in World War I, and 189 lost their lives. 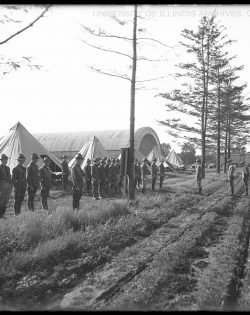 Tent camp with assembled cadets and as part of training for Battery F, with the Armory in the background. 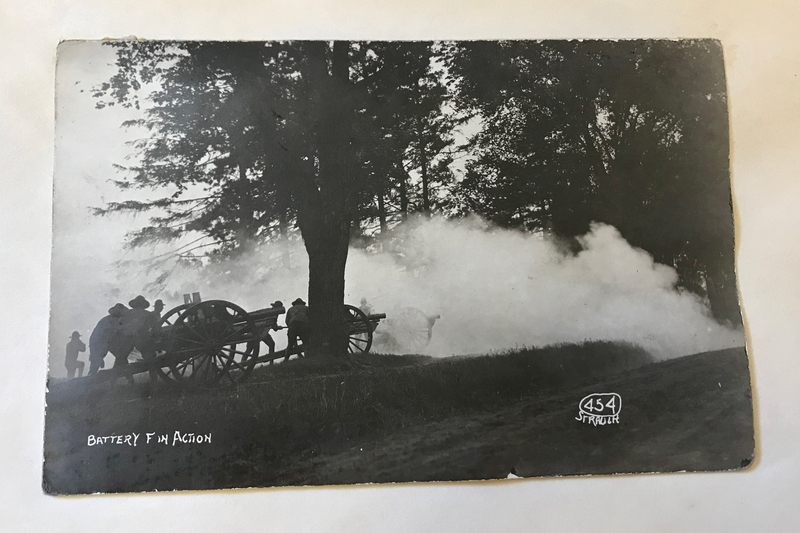 Enlisted students, faculty, and alumni would often send photographs back from the battlefield, like this one depicting Battery F. The 1920 Illio yearbook contains dozens of similar photos, providing an intimate portrait of war from the soldier’s point of view. Dean Thomas Arkle Clark kept a regular correspondence with hundreds of soldiers serving overseas, bringing them news of campus and reading their stories of life on the front lines. 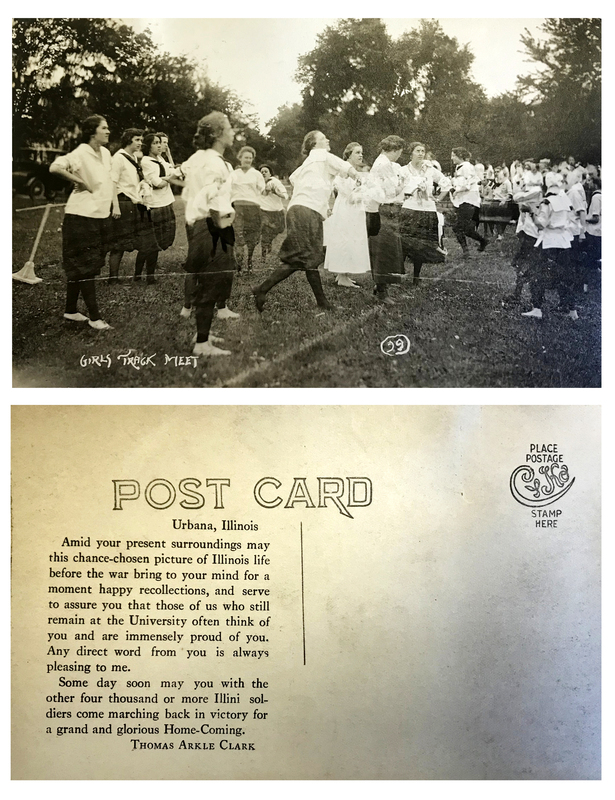 This postcard is an example of the many cards Dean Clark would send. He was also known to send care packages—he even sent a hand-knit sweater to one soldier! Like so many soldiers in WWI, alumnus Lt. Paul Clendenen suffered from influenza while overseas. The Alumni Quarterly reported that only a few weeks before he was killed in action, he led a raid on the enemy while “suffering from influenza and propped up on a cot, the only officer able to be on duty at all.” Clendenen was buried in the small French village of Gizacourt. 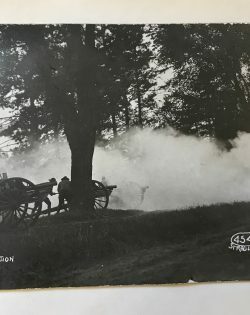 The 1920 issue of the campus yearbook, The Illio, provided extensive coverage of the Illini experience in World War I, including numerous contributions from men and women on the front lines who sent back photographs and stories from overseas. This list of vital facts prefaced the issue. Memorial Stadium was dedicated in 1924, in honor of the fallen Illini of World War I. Names of the soldiers appear on the colonnades. The $2M fundraising effort ($26M in today’s dollars) for the stadium was led by Athletic Director George Huff and Coach Bob Zuppke. October was a deadly month. Data gathered from around the world show an almost implausible spike in the number of people sick from influenza. On our own campus, the numbers of sick climbed daily. Dean Clark worked day and night to balance his responsibilities to the SATC, his regular duties dealing with student infractions and failing grades, and the growing number of students who needed intense medical care. He was already known for his high energy and intense schedule and, in less turbulent times, was rumored to see hundreds of students a day. 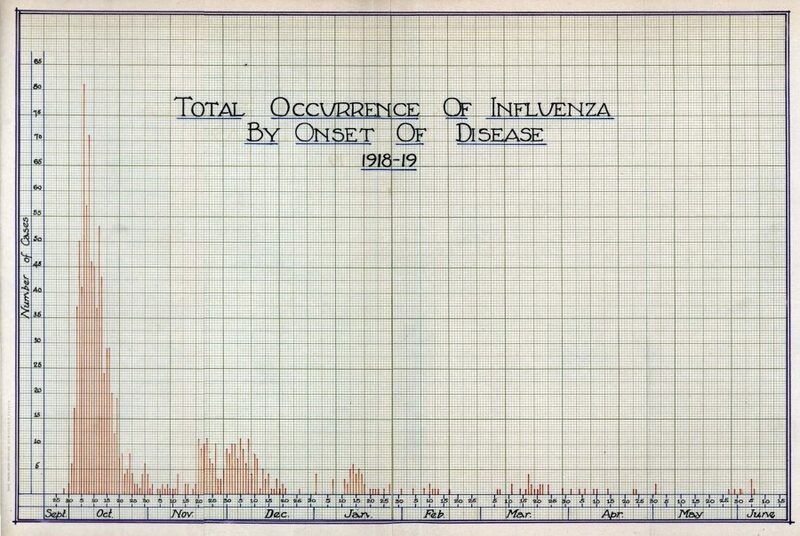 This chart from the 1918-1919 University of Illinois Health Services Annual Report shows an extraordinary spike in cases of influenza in the month of October, 1918. Reports from around the world looked much the same way. It is easy to imagine the dean hurriedly crossing campus to check on students in each of the emergency hospitals, his signature moustache making him instantly recognizable on the street. Dean Clark was steadfast and calm under pressure, but as the weeks passed, his letters illustrate the enormity of the situation—even for him. But in reality, Dean Clark’s work was just beginning. By the fourth week of October, during the time when alumni were supposed to flood campus in their orange and blue and sophomores would try to best freshman in the annual class competition, Dean Clark and a team of dedicated staff instead worked ceaselessly to keep campus from being overwhelmed by illness. Dean Clark was joined by many hard-working Illini, including the head of university health services Dr. J. Howard Beard and athletic director George Huff. 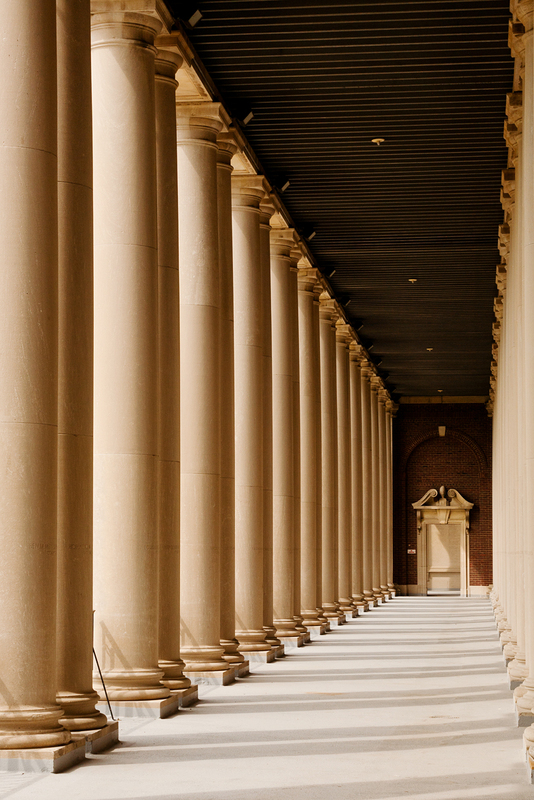 All three men are remembered in historical documents for their unfailing devotion to Illinois and to seeing the campus through its darkest times. And dark times they were. Fear was spreading along with the disease, and some students were afraid to go to class. At one point the alumni newsletter reported that Dean Clark along with Dr. Beard “helped to carry breakfast to the patients in College Hall when the servants became panicky and refused to go in.” Nearby, Indiana University officially closed its campus between October 10 and November 4, sending all students home who were not enlisted in SATC. Over the course of the three-month emergency, they had only a third as many patients as Illinois did. What is missing (or buried) in the records from this time are the contributions of nurses during the crisis. The November 1 issue of the Alumni Quarterly and Fortnightly News mentions that “The demands for medical attention entirely exhausted the efforts of local doctors, and nurses were simply not to be had. 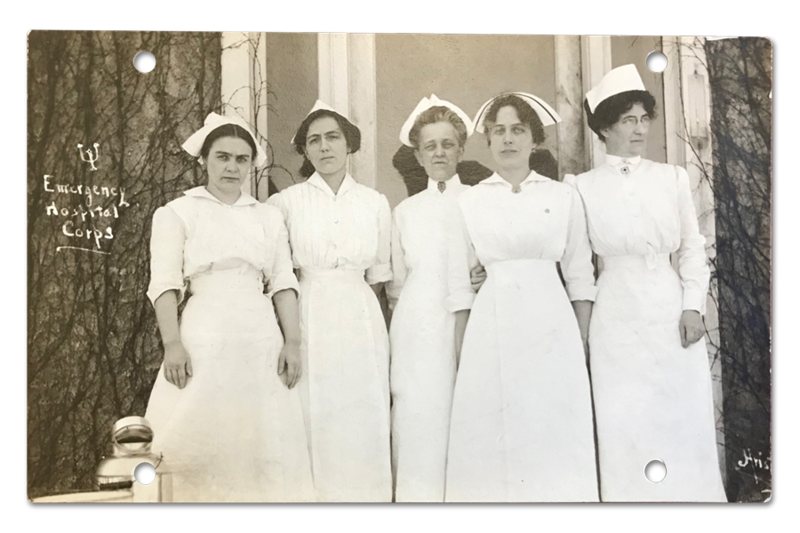 Miss Olive Condit, the nurse in charge, stuck to her post throughout the epidemic.” Dean Clark references recruiting university women to serve as nurses, but it is not clear how many answered his call. One record mentioned the employ of eighty-five nurses from around the state, but we came across no primary accounts of their experiences. Sadly, these stories are lost to history and we are left to wonder about the story of women like Olive Condit, whose efforts were undoubtedly heroic as they joined the efforts to selflessly attend to and provide comfort for the severely ill. This was the state of affairs when the weekend that would have been homecoming arrived. Despite the fact that all other homecoming events were canceled, the Illinois football team showed up on Saturday, October 26 to challenge eleven Navy men who were stationed at Chicago’s Municipal Pier. 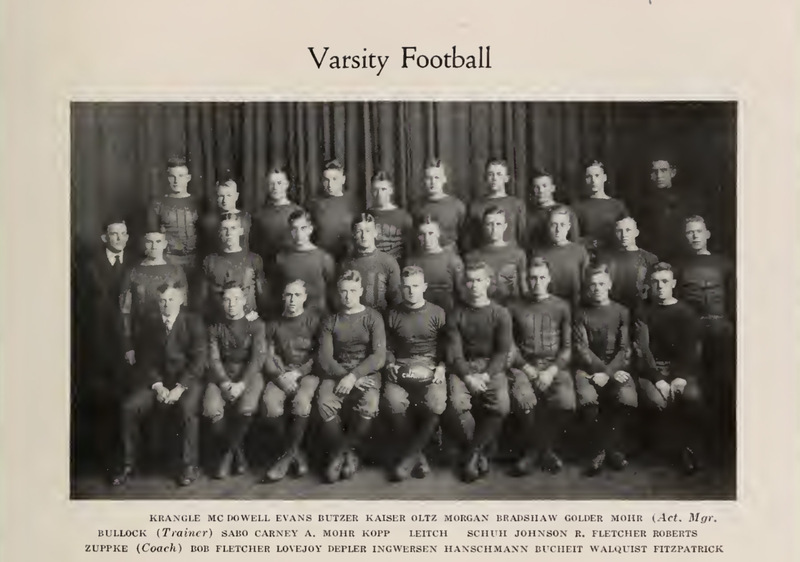 The 1918 Fighting Illini football team. The gates were closed to protect students, of course, but Dean Clark was not one to let the team play to complete silence. He gathered the head of the SATC and other military officers, walked through those gates, and that small group cheered mightily. By the beginning of November, it started to look like the worst was over—however the pandemic continued to keep the emergency hospitals busy through the end of December. The third wave of the pandemic appeared in the spring of 1919, but thankfully it was much like the first wave and not nearly as deadly as the fall. Experts are still trying to unravel the mystery of why this particular strain of flu was so virulent. In 2005, scientists managed to recreate the 1918 virus in the lab and fully sequence its genome. Work is underway to better understand the pandemic—and potentially how to predict and prepare for another. Over the course of those harrowing months, it is estimated that 2,500 Illinois students were treated in university hospitals—roughly 37 percent of the over 6,600 students on campus. In all, nineteen students died. The attentiveness with which doctors, nurses, and university officials worked to care for and protect Illinois students ensured that the mortality rate remained low. Compared with other state universities, Illinois had among the fewest deaths during the pandemic. Dean Clark, Dr. Beard, Huff, and others all were recognized for their remarkable efforts under complicated conditions. It was more than an exercise in administration, though. It was also an example of a loyalty to and love of this campus and our students. These men, as well as the doctors and nurses, each exposed themselves to risk in order to care for the very ill. Upon his passing, Dr. Beard was similarly remembered by none other than Turner. After his tumultuous first semester on campus, Turner went to work for Dean Clark in the spring of 1919. 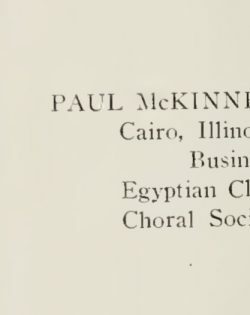 He worked in the dean’s office throughout his undergraduate years, became a trusted confidante, and ultimately succeeded Dean Clark as Dean of Men in 1931. Urbana, Ill.7-25-67FRED H. TURNER REFLECTS ON 1918. On the centennial of the university, in 1967, then Dean of Students Fred H. Turner talks about the influenza outbreak, SATC, and Dean Thomas Arkle Clark. 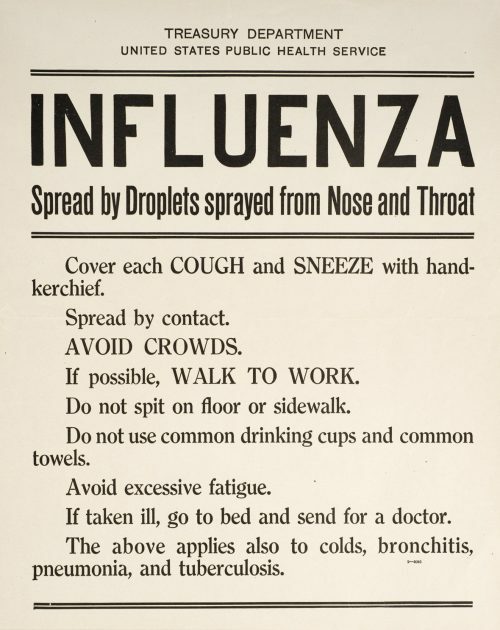 There were still students fighting through influenza into the new year, though the numbers were now much more manageable and life began to return to normal. The armistice was signed on November 11, 1918 ending World War I and SATC students were decommissioned by the end of December. It was hoped the new year would usher in a time of healing, that 1919 would be a salve to the deep wounds inflicted by the previous year. In the end, of course, campus recovered due in no small way to the selfless efforts of so many who came together in an extraordinary time. One hundred years later, few students know the stories behind the names of campus buildings. Two of these men are memorialized with buildings that anchor two corners of Fourth and Gregory streets: Huff Hall and Clark Hall. Fred Turner was similarly honored with the naming of the Turner Student Services Building. Their legacy is etched not only in the buildings’ stone, but also in the character of our campus.